8:00 a.m. After waking up this morning, I read my spiritual master’s Vyasa-puja homages to Srila Prabhupada throughout the years. 10:15 a.m. We set up an altar and had kirtana. With the last remaining batteries in our tape recorder, we listened to a lecture of Srila Prabhupada. 1:20 p.m. Took prasadam. Completed twelve rounds. Glued my torn shoes. Again we started to discuss how to leave this place as soon as possible. 2:30 p.m. This morning some Chechen fighters came, and one of them introduced himself as the State Security Chief and demanded the van. We couldn’t resist them. They had a driver with them who tried to attach the necessary parts to the engine. I volunteered to help him with the intention of making the process as slow as possible in the hope they would become discouraged and go away. The van is our only hope of getting out of here. Kalikrit approached me and asked in English if they would be able to start the engine? The Chechens looked at us suspiciously. They couldn’t start the engine, but they managed to push the van out of the yard and down the road. 7:20 p.m. After some time the State Security Chief came back with some of the soldiers and started to rough us up. They threw us out of the house and demanded that we walk towards the van. We realized that we were leaving that place forever. Sergey asked our host to keep our Deities. The van was surrounded by a number of Chechens trying to start the engine. They put us in the back of the van and then told me that unless I started the engine they would shoot us. Meanwhile, a crowd of local residents gathered around us. They recognized us as Hare Krsna Food for Life devotees and inquired from the officer where he wanted to take us. He explained that we were being taken away for interrogation. I started the van and they drove us away. Forty-five minutes later we arrived at a house where they had some type of impromptu office. Inside they searched us one by one, taking all our documents, papers, and anything they liked. When the time came for them to question me they asked for my possessions. All I had was a simple cloth bag with my Srimad-Bhagavatam, a notebook, a pen, and two pictures, one of Srila Gurudeva, and the other of his Nrsimha-salagrama, which he always carries around his neck. None of this interested them. Because the sleeves of my sweater were quite long they didn’t notice my wrist watch. After questioning me they pushed me into a dark room with the other devotees. Later on a few young Chechen fighters came in and brought us some fruit. They asked us to tell them about our faith. Eventually the older soldiers took us to the van and then to the ruined office of an oil refinery. 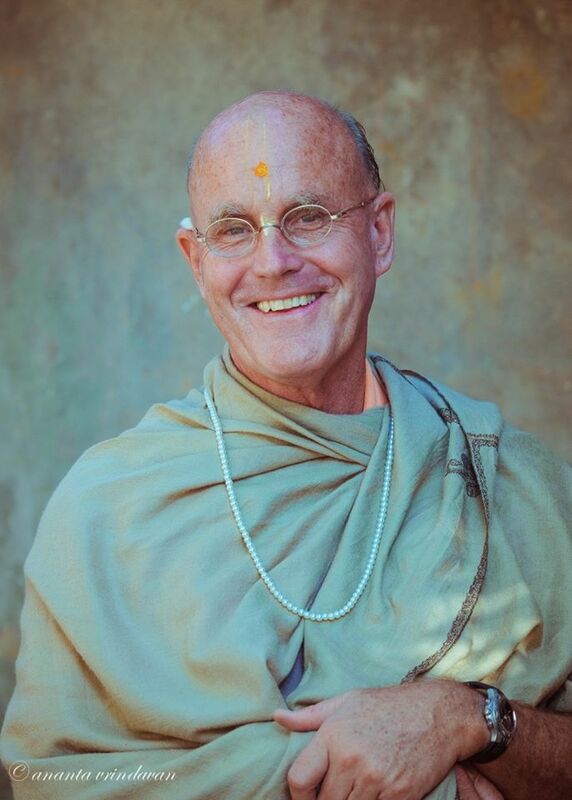 We watched from the window as they removed the canvas tent from the back of the van on which was written in bold letters, “Hare Krsna Food For Life.” What a foolish thing to do! They didn’t know that our sign and the reputation associated with it were safer than any armor. After some time we were escorted out of the oil refinery to the van and driven outside the city. The road was quite dangerous because Russian federal troops supposedly had checkpoints along the way and could attack us. Thus the entire way I was chanting prayers to Lord Nrsimhadeva. I noticed that the other devotees were also chanting with great concentration. By Krsna’s grace, we reached our destination safely. The van stopped at the gate of a big coal factory. The Chechen soldiers who brought us explained that their authorities wanted to exchange us for their soldiers who had been captured by Russians. 8:30 p.m. We waited in the van at the gates of the coal factory. I tried to read Srimad-Bhagavatam. One of the Chechen fighters started to look attentively through the illustrations in the Krsna book given to him by Mahäbuddhi. In a joking mood he started to ask some questions, and we again got a chance to preach. At last the gates opened and we drove in. By the mood of the Chechens we could understand that we were something valuable for them. In the twilight they pushed us roughly into a tiny room with boarded up windows. 9:00 p.m. I have chanted two more rounds of japa. I feel that here we’ll have to pass through the most serious test so far. Maybe it will be our last test. Kalikrit started to describe the courage and devotion of Prahläda Maharaja. I thought, “Yes, sooner or later we’ll have to leave this material world.” In the end, we offered our humble obeisances to each other. We wanted to encourage each other till the last moment.